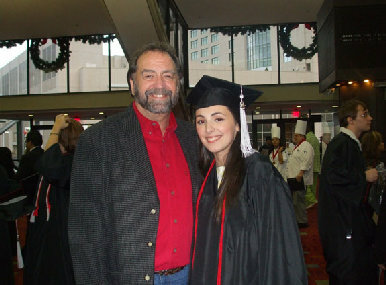 Haley, Paul’s youngest, seen here with Dad and her fiancé, Wes, graduates from The Art Institute of Atlanta last December. Cameron Puckett enjoys a Braves game with Big Daddy in the stadium suite belonging to Braves pitcher, John Smoltz. Lynn Baines, who sometimes sings with Paul in church and other venues. Paul’s enjoys his birthday with his kids and theirs at Little Refuge Church near Lake Arrowhead in <?xml:namespace prefix = "st1" ns = "urn:schemas-microsoft-com:office:smarttags" />North Georgia.